awww! ^-^ I actually adore the eyes! My only true complaint with it would probably be the left side of the nose-horn. Other than that, you might want to look at the black and white sketches Roarey raccoon did to emulate teh shadowing on my hair stripe that serves to represent the hot purple streak. Yeah, I think the inking messed it up a bit. I was trying to rush it so I could upload it before you had to go. I'll be redrawing it as a full body as well in my actual sketch book. This was just me trying it out in my lined notebook. And of course, I'll actually scan it in rather then taking a picture of it. I'll also take a look at those pictures you stated. Gotta get this character good before I can draw Me and you in a picture, lol. But overall, I'm glad you liked it. Haha, thanks for that. I wasn't super pleased with it, but the nice reviews make it easier. I sure as heck couldn't do any better... even if I directly traced it. 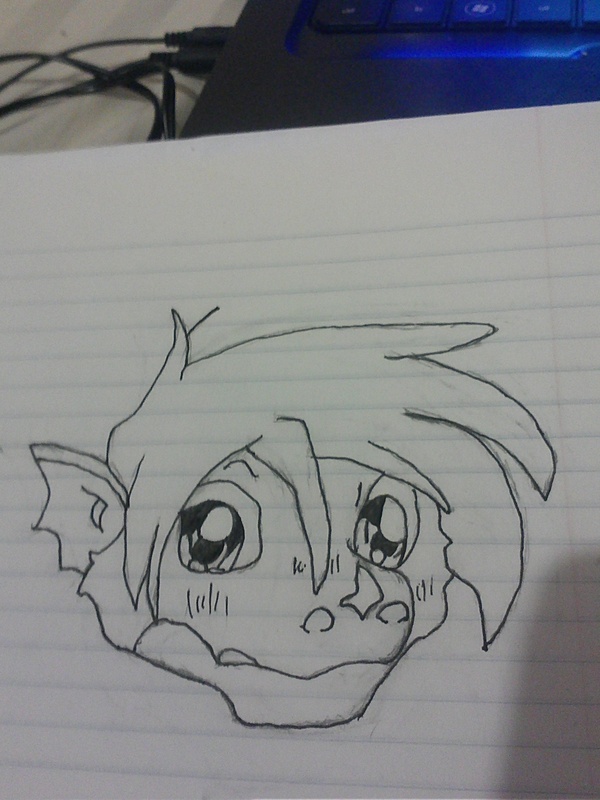 at first i thought this cute fello was a bat,perhalps kin to sachel but then read that in fact he is a young male dragon,yes he is a cutie and look foreward to seeing him and kevin doing lots more stuff together.